Back to the lovely North East to a new school (to us! 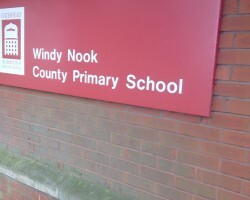 ), Windy Nook Primary in Gateshead. What a lovely name! (Windy Nook, I mean, not Gateshead!). And a lovely school too. As it was our first visit, we hit the school hard (not literally!) with Mokee Joe. The audience of around 90 Year 5’s and 6’s thoroughly enjoyed the experience. We did a workshop in the afternoon based on the short story collection – Ten O’ Clock Caller -and that went down a treat too. All in all, a great visit and we hope to be back. Thanks to everyone at Windy Nook for looking after us so well, and guess what? The weather was lovely and not a breath of wind! Over to the NE coast next to visit two schools very well known to us – Meadowdale and Lindisfarne Middle Schools. Mrs Finn, the head of Meadowdale, was waiting to greet us and give us a lovely North East hug. The pupils at this school are already big fans of my books and so we presented our brand new book, Kruschmeister, along with the prequel, Scabbajack. To say the presentation went down a storm is an understatement! The following day I signed books until my signing-hand almost gave up. I must give a mention to Abbi, a mega fan to say the least! Abbi had already contacted the website to tell me she had read every book I’d written apart from the new one. She came to say a special hello and was literally shaking with excitement. We had our pic taken together and as soon as the school e-mails it to me I shall insert it into this blog. Thanks, Abbi, and to all at Meadowdale for being so supportive of our work…we will be back…again! at the end of the next academic year. We did a repeat performance of the Meadowdale presentation to a packed hall of Years 5 to 8 and again, it went down a storm. Mrs Sue Oram-Graham looked after us in the usual VERY hospitable way and made this, our last visit, extremely enjoyable. Again, we signed books the next day until I was exhausted and the books almost ran out! I really can’t take in how many non-football fans are lining up to purchase the football-themed Kruschmeister. As one keen fan remarked, ‘Being scary is what it’s all about…never mind the theme!’ A big ‘thank you’ to Ian and Lauren for interviewing me brilliantly (they didn’t even ask me my age!) for the local newspaper. Hope you like the pic – it came out a bit ‘misty’, but not too bad. Whilst staying in Alnwick to visit Lindisfarne MS, we stayed at the fab B&B, Aln House. It has to be one of the best B&B’s in the UK and my breakfast (full English) was to die for! Thanks Bill and Jean for giving us such a good stay. Oh well, back to Rotherham now, to visit three cracking schools before half-term finally arrives. Kath and I left the peace and tranquillity of our Berkshire retreat to visit the nearby Park House School in Newbury. Thank goodness! It proved a great day and the new Year 7’s were a delight to work with. We started the day with all of the Year 7’s in the hall, launching our new book – Kruschmeister, but not before telling them about the prequel to the book – Scabbajack. Judging by the expressions on some of the Year 7 faces, the scariness of the Scabbajack novel really got to them! Having said that, they seemed more than keen to find out as much as I was prepared to tell them about the story. The new book, Kruschmeister, went down even more of a storm! 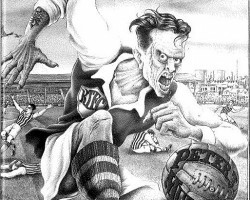 This book is a football-themed story, but the scariness of it still appeals to the most reluctant of football fans…and of course, to the hordes of keen of horror genre fans. groups, exploring the idea of building characters with reference to the new Kruschmeister book. Again, a great experience from our perspective; each of the three groups working with energy, enthusiasm and real attentiveness. As usual at Park House, we found all of the pupils and staff a delight to be around. The big book-signing the next day was a testament to the success of the visit – so many keen readers waiting to consume our books! 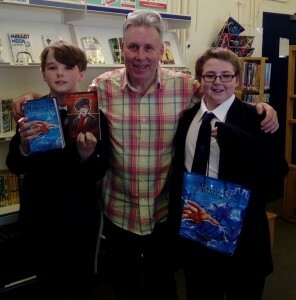 It turned out that lots of the Year 7’s had met me before at their primary schools and two boys almost needed a wheelbarrow to bring in their collections of Peter J Murray books to be re-signed and re-dedicated. Hope you like the pic of Harry and Owen. 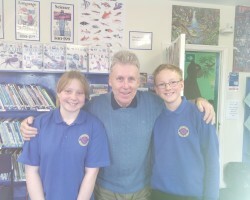 A BIG thank you to all at Park House School for giving Kath and I yet another visit to recall with fond memories. See you all again next year – with another new super-scary book!